When you hire a car / van / motorhome / minibus you naturally don't want to think about accidents, particularly when you are driving a hired vehicle. Unfortunately though, accidents can happen at any time when you are sitting behind the wheel.. Unless you have taken out something called collision damage waiver (CDW) then having even a minor accident in a hired car could prove very expensive indeed. Unless you have taken this out in many cases you won't be given the keys to the rental car. Collision damage waiver (CDW), sometimes confusingly also called loss damage waiver (LDW), is essentially a form of insurance that may or may not come included in the rental price of a hired car. It exists to provide cover for damage that occurs to the rented vehicle itself. It is because in some countries and with some hire companies, the basic hire charge only includes a limited form of insurance called third party. This means that anyone else involved in an accident with the vechile you have rented is covered, but the rented vehicle itself isn’t. If the car only has third party cover then any damage to it will need to be paid for by you the renter. Remember that even if the third party cover also includes theft risk for the rented vehicle, a large dent in the bodywork still won’t be covered and you’ll have to pay. Collision damage waiver is the insurance that will provide cover for damage to the rented vehicle; it may be included in the hire price in some cases, or the car hire company may offer it to the renter as a chargeable extra. In either case, it would be prudent to check to ensure what it covers as some CDW policies can exclude damage to certain commonly damaged areas of a vehicle such as tyres, wheels and windows, - all these areas can be expensive to repair if damaged and it will be you the renter that has to pay. It is also usually a good idea to be clear what excess the policy carries. Collision damage waiver policies sold through the car rental companies may have a hefty excess on them – that is the ‘first part’ of any claim amount that the renter will be expected to pay themselves. It’s not unusual to see this stated to be in the range 500-1500pounds sterling. If you decide, for peace of mind and security, that you want the best CDW cover possible at the lowest price, then it can be purchased not only from car rental companies but also general insurance companies – often via the Internet. The CDW policies sold by insurance companies cover a policyholder and not a rented car so they will cover all rented vehicles used by the policyholder within the life period of the policy. 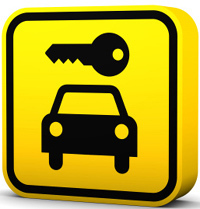 This means that the price is often very attractive when compared to similar offerings from the car rental companies and furthermore, they frequently will cover areas of vehicles typically excluded from cover by the rental company’s policy. For collision damage waiver, as with all insurance, it is usually a good idea to shop around in advance to find the best deal possible. It’s worth doing some Internet searching and familiarising yourself with the offerings available – you could save some serious money! According to one major car rental operator in Ireland, if you "WAIVE CDR" MasterCard Auto Rental Insurance and Canadian Visa Card Auto rental Insurance MAY ALLOW you to waive the cost of Theft Protection and Collision Damage Waiver (CDW) for rental cars in some countries. For Ireland this coverage is ONLY available with a limited number of Mastercard´s issued by a US bank and some Canadian Visa card programs. If you pay for the full rental with your eligible MasterCard card or Canadian Visa Card you may be covered for up to $50,000 Auto rental Insurance for your rental without excess. This insurance may cover the rental vehicle. This is an insurance program, certain restrictions and exclusions apply. In order to establish if your MasterCard or Canadian Visa includes Auto Rental Insurance in the Republic of Ireland please call your credit card issuer and/or MasterCard/Canadian Visa before making your reservation. This coverage is a service provided by MasterCard/VISA Canada to the cardholder and therefore it is the card holders responsibility to ensure that they are adequately covered for the entire duration of the rental period. Should you choose to waive our CDW insurance we require written confirmation from your credit card issuer that you have adequate auto rental insurance for the duration of your rental. This must be presented on pick up. Contact Details for Mastercard and Visa Canada Mastercard can be contacted from the U.S. by calling 1-800-MC-ASSIST. Visa Canada can be contacted from Canada by calling 416.367.8472 In order to establish if your MasterCard or Canadian Visa includes Auto Rental Insurance in the Republic of Ireland please call your credit card issuer and/or MasterCard/Canadian Visa before making your reservation. It is important to confirm to your credit card issuer that the Republic of Ireland as your place of rental. The major Irish car rental company has informed us that they can not accept Auto Rental Insurance Programs offered by European Banks and Credit card institutions and reserve the right to refuse third party insurers details if not satisfied with the coverage on their rental vehicle. When you book your car hire on line unless you have checked with your credit card company first, make sure you don't decline this as it will probably cost you a lot more when you turn up to collect the pre-booked car than had you paid for it when you made the booking. If you have a credit card which covers your Collision Damage (CDW) – will you need additional cover? You should carefully read the policy that is provided by the credit card company to determine the coverage, ensuring that it covers the country in which you are renting the vehicle, and whether or not there is an Excess (non waiver, deductible) on the policy. When you hire a car you need two types of insurance. One is Third Party which covers you for any damage or injury you may cause to someone else when driving the hire car. The second is Collision Damage Waiver Insurance (CDW) and this covers you for any damage to the hire car itself while it is in your care. An important thing to remember with collision damage waiver insurance is that even if you have paid out and bought cover from the car hire company, you still may not be completely covered. In fact you could still be liable to pay out considerable sums of money in the event that you have an accident and damage the hire car. This is because as with many types of insurance buying the basic insurance does not mean that you are fully covered. 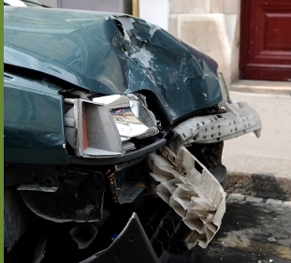 Insurance often comes with excesses and collision damage waiver insurance is no exception. What this means for your rental is that if you are unlucky enough to have an accident in the hire car your collision damage waiver insurance may only cover part of the costs and you would be responsible for the remainder. How much the remainder would be depends obviously on the amount of damage but also on the size of the excess. As an example, your collision damage waiver policy has an excess of £500 GB pounds and you unfortunately cause damage to the car that the insurers say will cost £750 GB pounds to repair. In this case, the insurance company will charge the whole of the excess amount to your credit card and they will contribute only £250 GB pounds. It may be worth pointing out here that excesses can be as much as £1,500 GB pounds. Another area where you can find yourself liable for costs is if you cause damage to the parts of the car normally excluded from insurance policies. These parts are the windscreen, tyres, roof and undercarriage; easy to damage and expensive to fix, particularly if you have no say in who does it or at what cost. You can of course extend the cover of your collision damage waiver policy by buying additional insurance to remove or at least reduce the excess and possibly even include those exclusions. What you may find though is that if you take the additional insurance offered by the car hire company you will end up paying a lot of money for the additional peace of mind of knowing that you are adequately insured. You may find that the car hire insurance offered by the specialist insurers will be significantly cheaper than the equivalent insurance offered by the car hire company. Even if you rental deal includes a basic form of collision damage waiver insurance you can still buy any additional policies elsewhere and benefit from significantly lower prices. Many specialist policies may even include those 'exclusions' such as the tyres, windscreen etc as standard. If you have hired a car and taken out the appropriate insurance, you may understandably think that there is little or no possibility of 'unexpected costs' coming from the car rental company. Unfortunately you could be mistaken - even if you have purchased from the hire company something called Collision Damage Waiver insurance. Collision damage waiver or CDW, is a form of insurance that covers you, the renter, against any costs arising from an accident than damages the rental car. CDW may be included in the rental price or in some countries, most notably the USA, the rental company may offer it to you as a separately chargeable option. If the rental company have not bundled CDW into the rental price, it may be worth thinking about buying it from a specialist provider of car rental insurance. Such companies operate in the open insurance marketplace, usually on the Internet and often sell various forms of rental car insurance at far cheaper prices than the car rental companies. If you have taken or purchased your collision damage waiver insurance from a car rental company, you may have to watch two aspects of their policy cover and this is where the risks of unpleasant surprises and additional costs come from. It is highly likely that their insurance will not cover all areas of the rented vehicle and may exclude the wheels, tyres, windows, undercarriage and roof. The second potential issue relates to the subject of policy excess. The car rental company's policy will almost certainly carry excess to the value of 500 to 1500 pounds. That is the amount the rental company could bill you following an accident as your 'obligatory contribution' towards the cost of any accidents even if you have their insurance in place. So even if you have only a minor accident AND you have the rental company's collision damage waiver cover in place, you could still find yourself with a large and unexpected charge to your credit card for repairs. This does happen and when it does, the amounts can be high - so be warned! You can pay the car rental company for additional insurance that may reduce or remove the excess and possibly cover the often-excluded areas of the vehicle. The good news is that if you have purchased your CDW from a specialist provider then there may be no areas of the vehicle excluded from their policy and another large bonus is that their policy may also not carry excess. This could work out far cheaper than paying for additional 'top-up' insurance through the rental company. One final point relating to the collision damage waiver products sold by the specialist insurance providers is that they are sold for a period of time (a daily or annual basis) rather than a specific car rental. What this means is that the policyholder can use their insurance to cover any vehicle they rent during the lifetime of the policy, with the exception of some specialist vehicles such as sports cars or those over $100,000 US dollars in value. It may be worth finding out more through one of these web sites if you're interested in saving yourself a lot of money. Loss Damage Waiver (LDW) is a type of insurance cover for rental cars. It can also be known as Collision Damage Waiver (CDW). 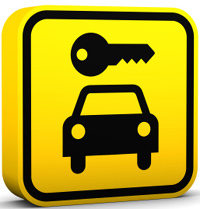 It typically covers the loss of, and damage to, your hire car and generally includes theft. While it isn't really insurance, it works in pretty much the same way. You could look at it from the point of view that since the hire car doesn't belong to you, you can't insure it but you are responsible for any damage that happens to it during the period of your rental. The owners (the car rental company) may typically try to sell you a release from this responsibility known as loss damage waiver. With this they 'waive' their right to charge you for repairs. Cover of this nature is very like insurance in that it typically carries an excess, which is the amount of money that you agree to pay to the car hire company in the event that the hire car is damaged while on rental to you. In addition to the excess you may find that loss damage waiver excludes the windscreen, the tyres, the roof and the undercarriage from its cover. This means that if you damage any of these parts during your rental then you would still be responsible to pay for their repair. These costs would be separate to any excess charges due for damage to other parts of the car. If, like many, you feel that the potential expense in these circumstances is unacceptable, then you may choose to buy some excess insurance to top-up the loss damage waiver cover. If you then damaged the car, you would claim on this policy for the excess that you would be responsible for paying. You may find that the excess insurance offered by the car hire companies is more expensive than that available from other sources. Happily there can be cheaper cover out there which often has the added benefit of covering those excluded parts as well and at no extra cost. 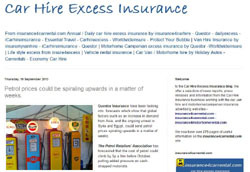 You can find it on the web site of some of the Internet based car hire insurance providers. These specialists can also supply policies specifically tailored for rentals in the UK, Europe, USA or other destinations worldwide. 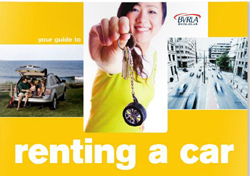 They also offer longer-term annual cover that may be of special interest if you rent cars frequently. An annual policy would provide you with excess cover for all of your rentals in the course of a year (one at a time of course). These specialist providers tend not to cover the more exotic makes of car such as sports or vintage models or very high value vehicles. They can also offer LDW (Loss Damage Waiver) cover for USA rentals (and some other destinations worldwide) that again may be very much cheaper than the cover you could buy at the car rental desk. You simply buy your policy from the specialists in advance of your rental and take the policy details with you, as your car hire company may need them to contact your insurer if you have an accident. So, whether you're looking for loss damage waiver cover, excess cover or both, why not have a look at what these specialist providers have on offer?